Beachadwriter’s journey to weight loss started several years ago. 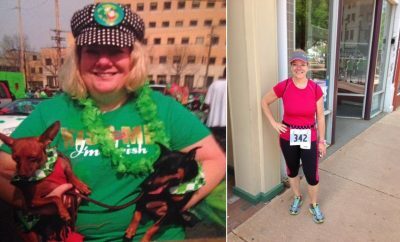 In her story she discusses how learning portion control and adding daily exercise has helped her shed 116lbs. 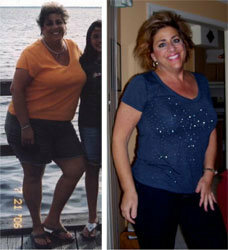 Read on for her weight loss tips, all taken from her own experiences. Being in my early 40’s and told by a new doctor, “Congratulations, you are a raging diabetic” certainly got my attention. My daughter was only 18 months old and I knew I had to vow to change my life if I wanted to be around to see her grow up. Gracious! I was a chubby child….my parents started me on my first diet in elementary school. Primarily cutting back on food. I was a severe asthmatic as a child, so couldn’t exercise. My dad made fun of me when I took ballet…claiming I wore a four-four rather than a too-too. Painful words to a child. attitude? What was the most important change? The biggest most important change was learning portion control and daily exercise. As someone said to me recently, “The 18th Hershey’s kiss doesn’t taste any better than the first 2.” How right they are! I truly believe exercise is the fountain of youth. I am in the gym 4-5 days a week, hour and a half at a time. I’ve never felt better in my life. Being able to input specific foods and ingredients to come up with a calorie count was so very helpful. That and some of the tips that arrived via email. God send! Not weighing every single day and feeling guilty about a 1-2 lb. shift in weight. Sometimes you just hold more water, and of course, fluctuation is simply a part of life. I have lost weight fairly gradually over 10 years. The last lump (from 278 to 195) came over the past 4 years. I have finally learned to eat like my slim teenage daughter. One plate, one portion, period. No seconds. I knew I was a success when people passed me that had known me in the past without recognizing me. Happened twice very recently. People can’t believe the new and improved me! Stay in the gym, watch every bite I put in my mouth. I have FINALLY broken the cycle of emotional eating. This was a biggy for me! I feel normal. I am smaller than I was in high school! I actually wear a misses size for the first time in my adult life. I am truly blessed. Write down every bite you put in your mouth. Exercise every single day, even if it’s a simple walk or bike ride. Learn to love yourself no matter what the scale says. Learn to love exercise. It is a Godsend to MOVE!